Reminisce Smith (born 30 Mey 1980), better kent bi her stage name Remy Ma, umwhile Rémy Martin, is a Grammy-nominatit American rapper an umwhile member o Big Pun's rap crew, Terror Squad. Ma wis featured on the group's hit sang "Lean Back" frae their seicont album True Story an M.O.P. 's "Ante Up (Remix)." 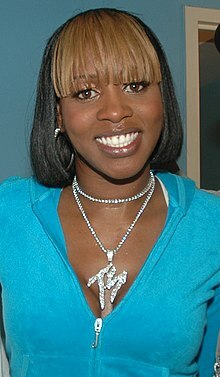 Her debut solo album, There's Something about Remy: Based on a True Story, wis released on 7 Februar 2006. ↑ Brown, Marisa. "Remy Ma > Biography". Allmusic. Retrieved July 28, 2010. This page wis last eeditit on 29 August 2018, at 20:33.